Two dolls in progress amid the chaos that is my studio. The messier the room, the more I am getting done. The room gets cleaned up on the bad days. Or when it gets completely unworkable! mimi---truer words were never spoken! When creativity and productivity strike, so does messiness. Sometimes when I'm having a creative block, I clean and organize my studio. 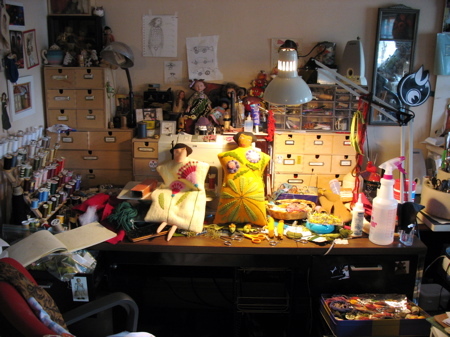 It's funny how doing that can spark some inspiration again and bring me back to the goal of messy-studio-space productivity!